G Suite is an identity and access management provider by Google that enables frictionless login for enterprise apps. 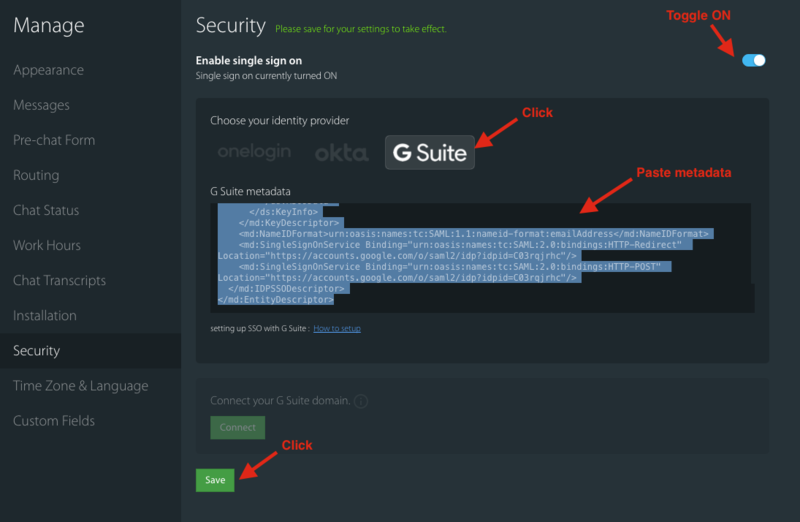 Using G Suite, your agents can login securely without using a password. 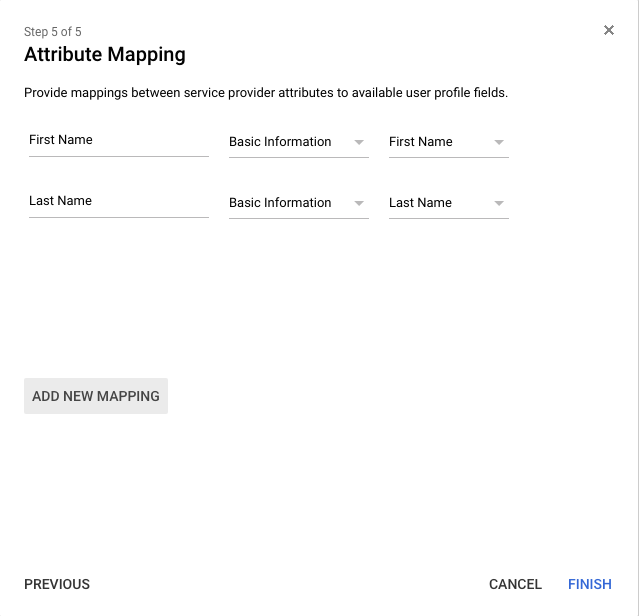 The user account with which you connect the domain must have either Super Admin role or User Management Admin role to contact the google APIs and connect successfully. 1. 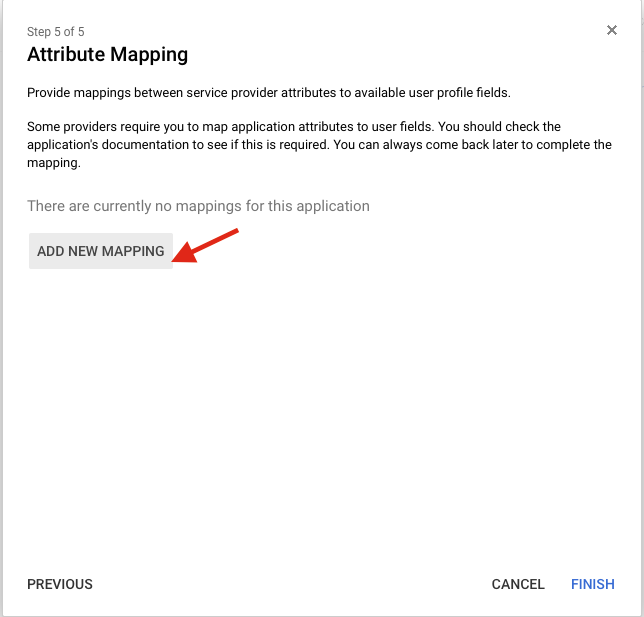 Login in to G Suite admin account. 2. 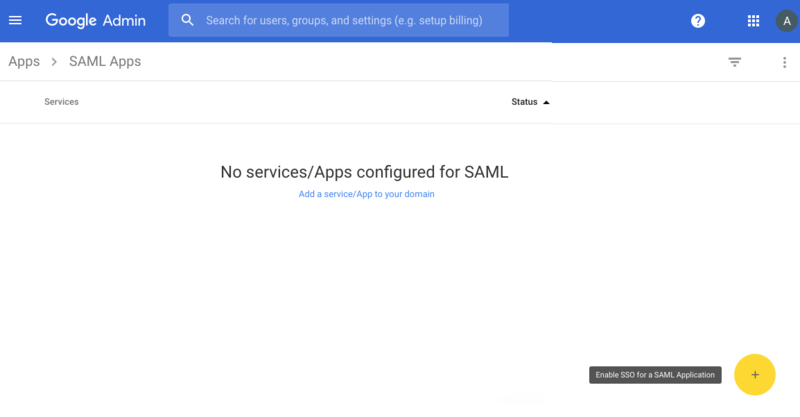 Click on "Apps" and then click "SAML Apps". 3. 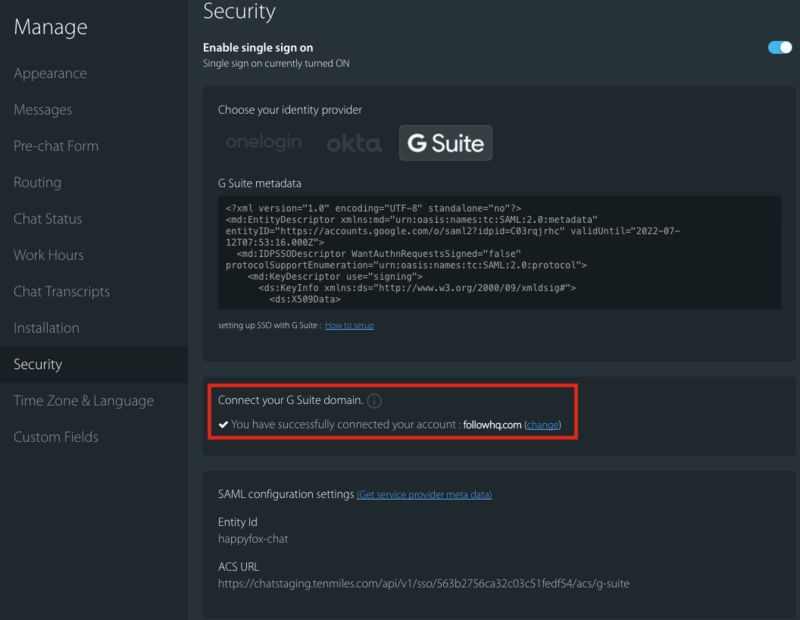 Now click on the '+' symbol (Enable SSO for a SAML application). 4. 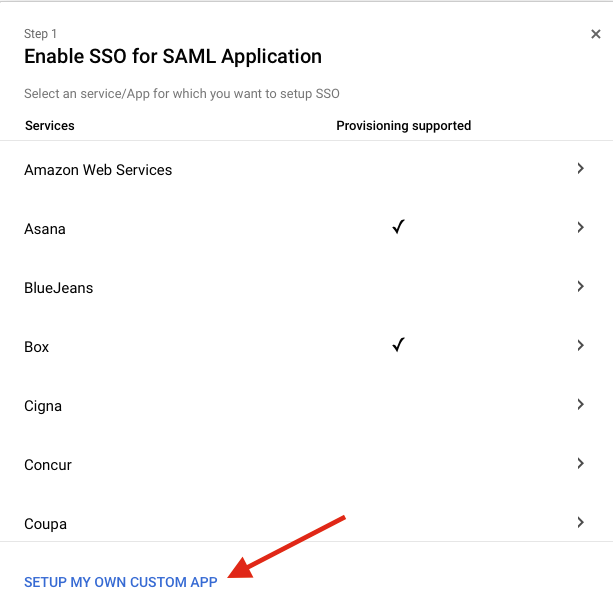 Click on "Set up my own custom app". 5. The popup will show two options. 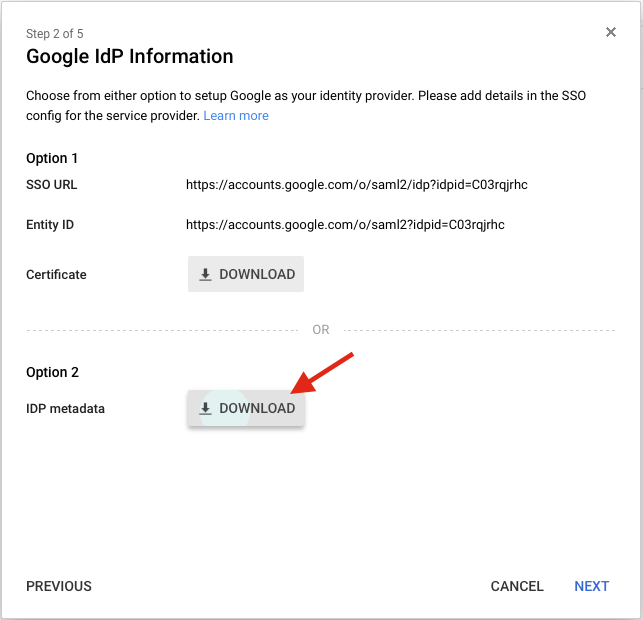 You should download the IDP metadata from option 2. 6. 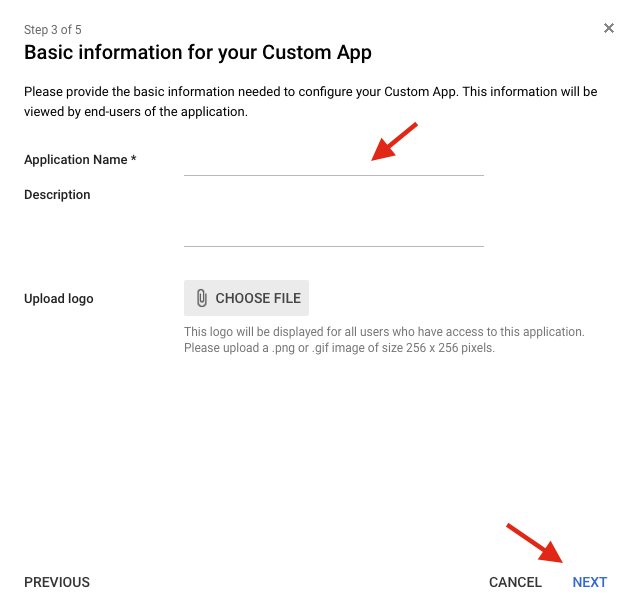 After downloading metadata, click next and set the application name and upload the logo (if required). 7. Copy paste the metadata xml (downloaded in 6th step) inside the Manage >> security settings in your HappyFox Chat account. 8. Once you click "Save". ACS URL and Entity ID will be generated. 9. 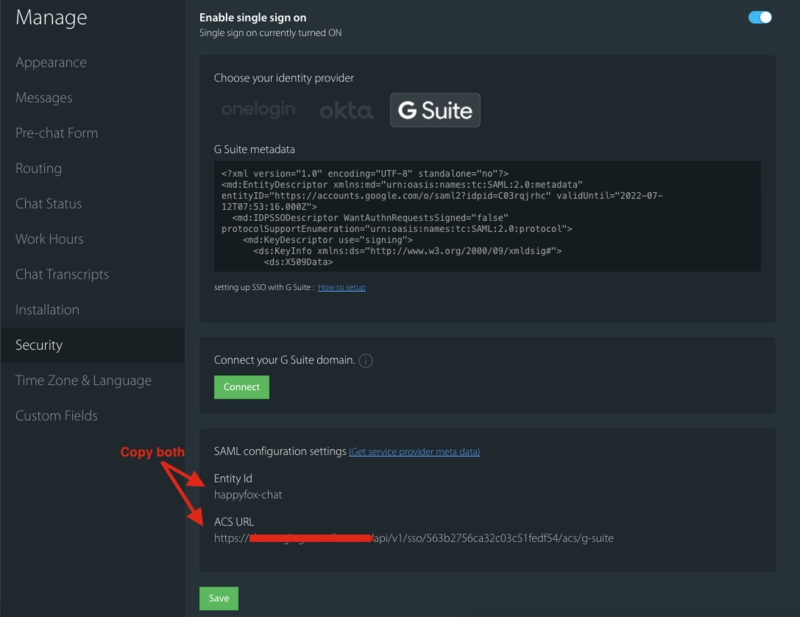 Copy these two fields and paste them inside custom SAML app (in G Suite) in their respective fields and click next. 10. Now we should set the first name and last name attributes. 11. Add an attribute called "First Name" and select "Basic Information" in the category and then select "First Name" in the user field dropdown. 12. Add another attribute called "Last Name" and select "Basic Information" and "Last Name" in the category and user field dropdown respectively. And Click Finish. 13. Change status to "On for Everyone" (you can change the status by clicking on 3 vertical dots). Agents will now see HappyFox Chat app listed under apps. 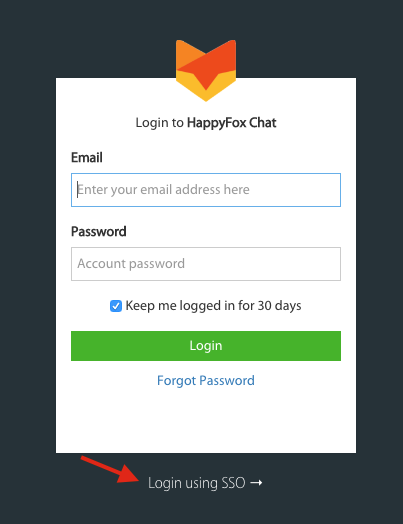 To gain access for into HappyFox Chat, for the first time login alone agents/users should login to their G Suite account and click HappyFox Chat app. It will taken them to HappyFox Chat's page. 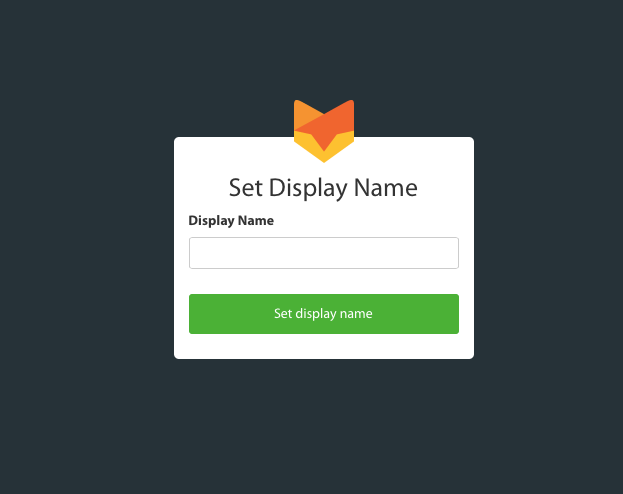 Users can enter preferred Display Name and then they will be logged in to the HappyFox Chat account. For consecutive logins they can also use Login with SSO link present on HappyFox Chat's login page. After creating the app, we should connect HappyFox Chat with the G Suite domain. "Connect" is for provisioning / syncing HappyFox Chat and G Suite accounts. Example: If a user is added/deleted in G Suite, the user will be added/deactivated on your HappyFox Chat account. 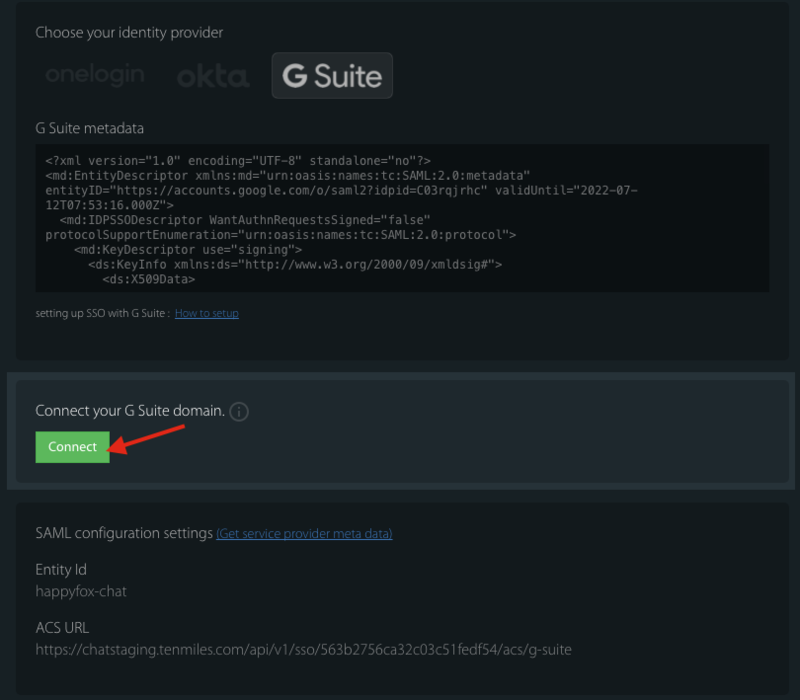 Now click "connect" button under "Connect your G Suite domain" settings in the Manage >> Security page. You will be prompted to authenticate. 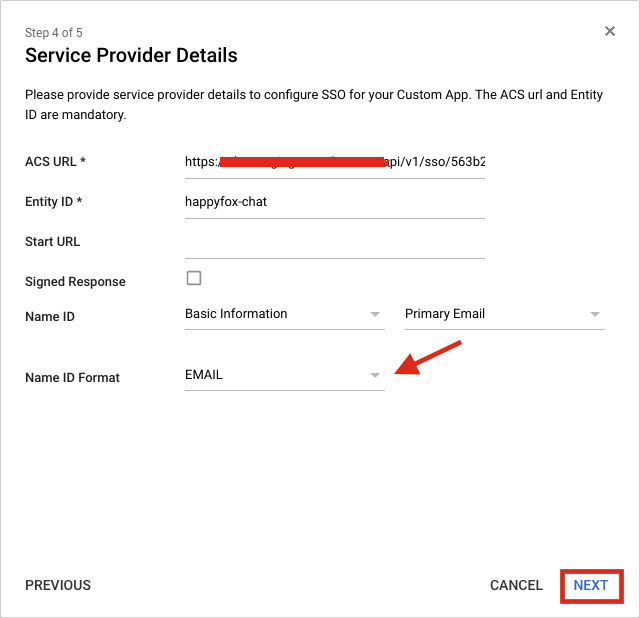 You can now add agents to your HappyFox Chat account via your G Suite admin account. Similarly, deleting/suspending users will be in sync.